Nitroglycerin is a powerful explosive, detonating when exposed to heat or pressure. The same molecule, however, can save your life if you're experiencing a heart attack. A small dose of nitroglycerin will slowly break down and release nitric oxide (NO), which then spreads to the muscle cells surrounding blood vessels, telling them to relax. The curative properties of nitroglycerin have been used in this way for over a century, but scientists have only recently revealed how NO performs its job. Nitric oxide is a colorless gas composed of a nitrogen atom and an oxygen atom. It is used in two ways in your body: for signaling and for attack. It is produced continuously at low levels by cells, where it acts as a messenger, controlling functions such as the contraction of muscle cells and growth of nerve cells. NO is particularly effective as a messenger: it diffuses rapidly because it is such a small molecule, but stays relatively localized because it is reactive and is rapidly inactivated. This reactivity is also used in the other major function of NO. It is made in larger bursts by cells in the immune system to kill pathogens. Animal cells make three similar types of nitric oxide synthase (NOS), to produce NO for these different functions. Neuronal NOS (shown here) and endothelial NOS continually produce low levels of NO used for signaling. Inducible NOS, on the other hand, makes large toxic bursts of NO to fight pathogens. All are complex enzymes with many functional parts, and researchers have determined their structures by breaking them into manageable pieces. The portion shown at the top creates NO by adding oxygen to the amino acid arginine, using a heme group to assist with the reaction. It was the first portion to be studied by crystallography, first for inducible NOS (PDB entry 1nod ) then for the neuronal version shown here (PDB entry 1om4). The portion at the bottom (PDB entry 1tll ) feeds electrons to the upper portion. 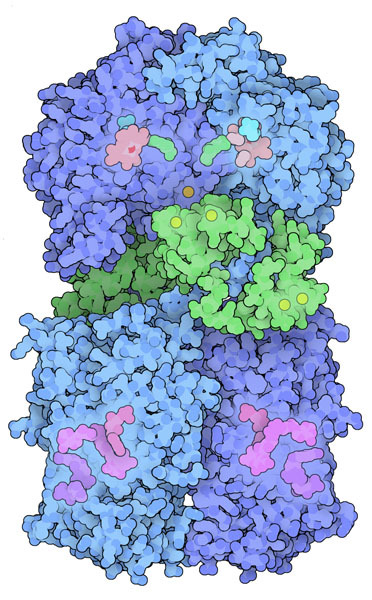 The short segment connecting the two halves binds to calmodulin (shown here in green, PDB entry 2o60 ), which helps to control the flow of electrons. The message carried by NO is received by soluble guanylate cyclase, a complex enzyme that initiates a cascade of responses inside the cell. When it binds to a molecule of NO, it becomes active and converts GTP into cyclic GMP. This molecule then acts as a second messenger, activating kinases that then mobilize all of the molecules needed to perform the desired physiological function. Like NOS, soluble guanylate cyclase is also a complex multi-domain protein studied by crystallographers in parts. The NO-binding domain is shown at the top (PDB entry 2o0c ) and the cyclase enzyme is shown at the bottom (PDB entry 3et6 ), and several other domains connect the two (PDB entries 3hls and 2p04 ). The three forms of NOS are very similar, but researchers are taking advantage of small differences to create drugs to block one, but not the others. This would be very useful: for instance, the inducible NOS plays a role in Parkinson's disease, Alzheimer's disease and multiple sclerosis, so a drug that blocks it, but not the other forms of NOS, could be used to help treat these diseases. Unfortunately, the active sites of the three forms are almost identical, so researchers have been forced to design larger drugs that reach into areas that show differences. To compare the structures of the catalytic domain of inducible NOS (PDB entry 1nod ), endothelial NOS (PDB entry 2nse ), neuronal NOS (PDB entry 1om4 ), and NOS with an inhibitor bound in the active site (PDB entry 3e7t ), click on the image for an interactive Jmol. Nitric oxide synthase is also made in some bacteria. You can compare the structures of the bacterial enzymes with the mammalian enzymes using the "Structure Comparison" tool at the PDB. 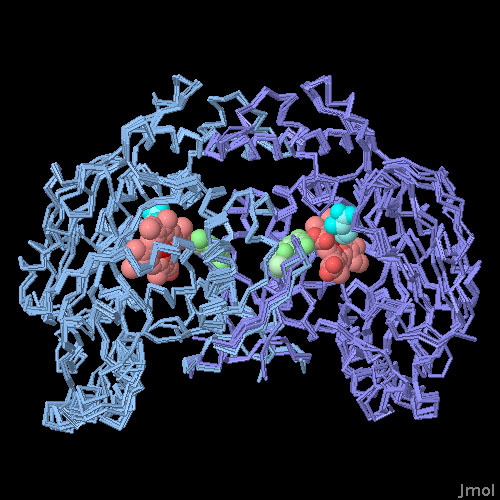 Many structures of trial drugs bound to nitric oxide synthase are available in the PDB. You can use the "Ligand Explorer" to examine the interaction of these drugs with the enzyme and enzyme cofactors. C. Villanueva and C. Giulivi (2010) Subcellular and cellular locations of nitric oxide synthase isoforms as determinants of health and disease. Free Radical Biology and Medicine 49, 307-316. T. L. Poulos (2006) Soluble guanylate cyclase. Current Opinion in Structural Biology 16, 736-743. 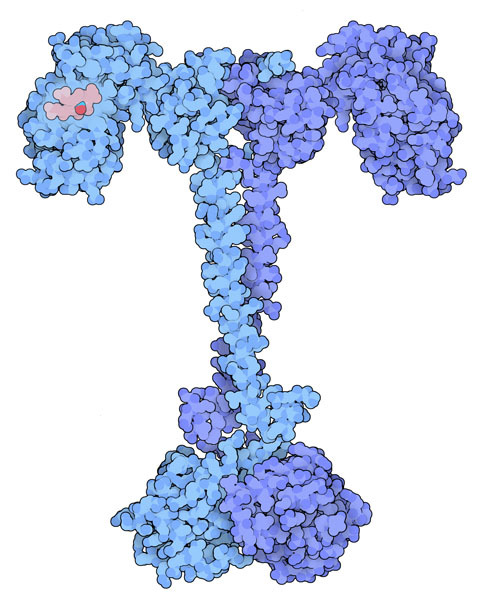 H. Li and T. L. Poulos (2005) Structure-function studies on nitric oxide synthases. Journal of Inorganic Biochemistry 99, 293-305. D. J. Stuehr, C. C. Wei, J. Santolini, Z. Wang, M. Aoyagi and E. D. Getzoff (2004) Radical reactions of nitric oxide synthases. Biochemical Society Symposium 71, 39-49.